Hey everyone, we are back in action with another volume of Shop Shots. This week’s pictures are a little late, thanks to the internet being down at work. But never fear, we are still rolling along. Alright, enough rambling, let’s get to those pictures. The first picture today comes from a fellow VW tech named Matthew in WI. The tech working next to him had to pull the seat up for a repair. This is what he found. It looks like enough hair to make a little critter. This is a shot of under the drivers seat. You can see the shifter at the top right of the picture. That may also be a nickle at the bottom left. 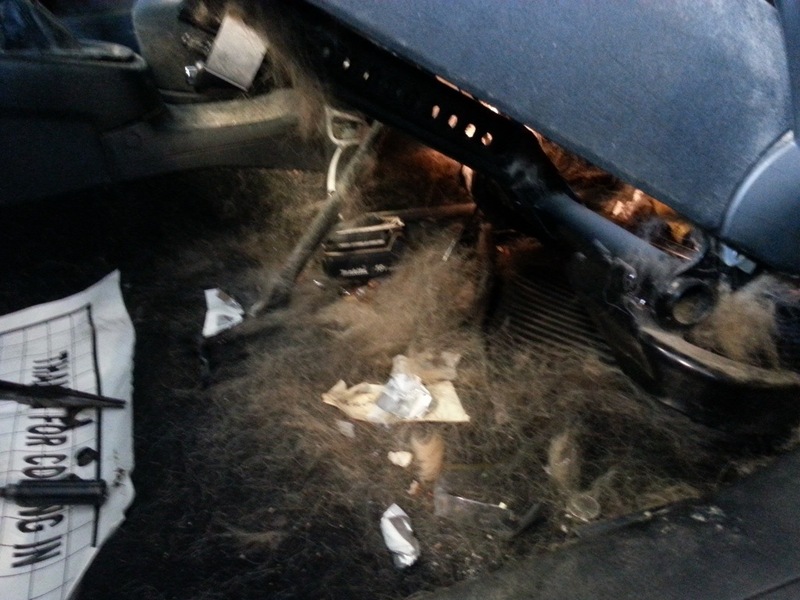 I have seen lots of hair and gross stuff under customer’s seats, but this may be the worst.Thanks for sending this in Matthew. 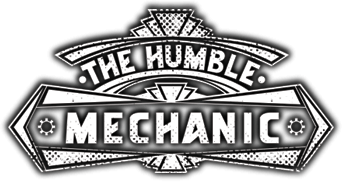 I talk a fair about VW transmission issues, and valve body failures. I figured it was time to actually show you guys what a VW valve body looks like. 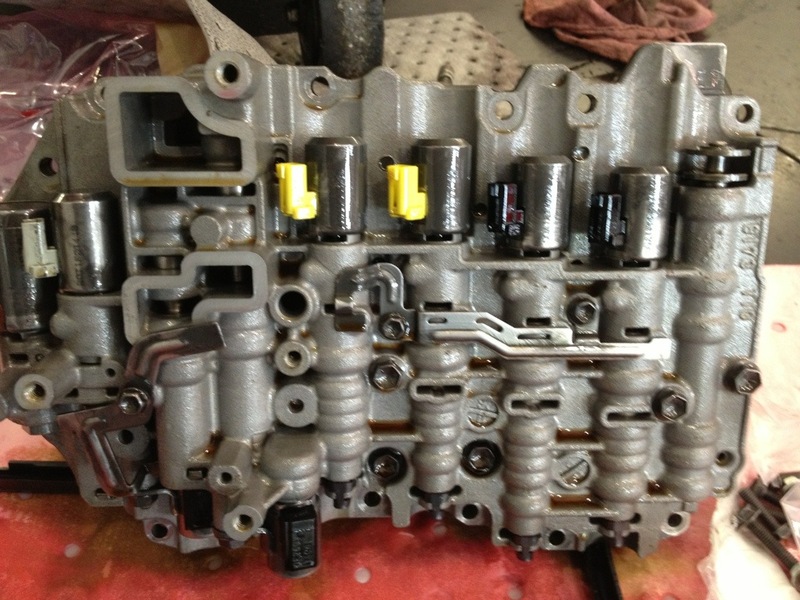 The valve body is what controls the fluid in the transmission. It uses solenoids to hold or release fluid pressure. I replaced this one for an extremely hard shift from 2nd gear to 3rd gear. The job is pretty easy. The only part I don’t care for is being covered in transmission fluid. The up side is, all the tools I use on the job are really clean when I am done. Most automatic transmission fluid as great detergent packages in it. It is one of the best things for cleaning tools. Staying with the VW transmission theme, we move to a manual transmission. This is a close up of a dual mass flywheel. The customer had their car towed in because it would not start. The car had severe damage to the clutch and release bearing. In addition to that, the flywheel shifted. Normally you can see the bolts through the 6 bolt holes. As you can see, there is very little bolt head showing. I have seen that before, but this was the worst I have dealt with. I was not able to shift the flywheel to gain access to the bolts. I had to take some extra measures and cut the flywheel off. It was not pleasant, but we got it done. That wraps it up for Shop Shots this week. Don’t forget, if you have any VW or general car questions, use the Contact me form and ask away. I will do my best to help you out. Also, if you have a question odds are others do too. So ask away! The hair is pretty nasty, the only time I have seen that much hair on anything automotive related was a guy who let his cat use an old seat out of a car as a bed. On the flywheel, do those bolts hold it on? 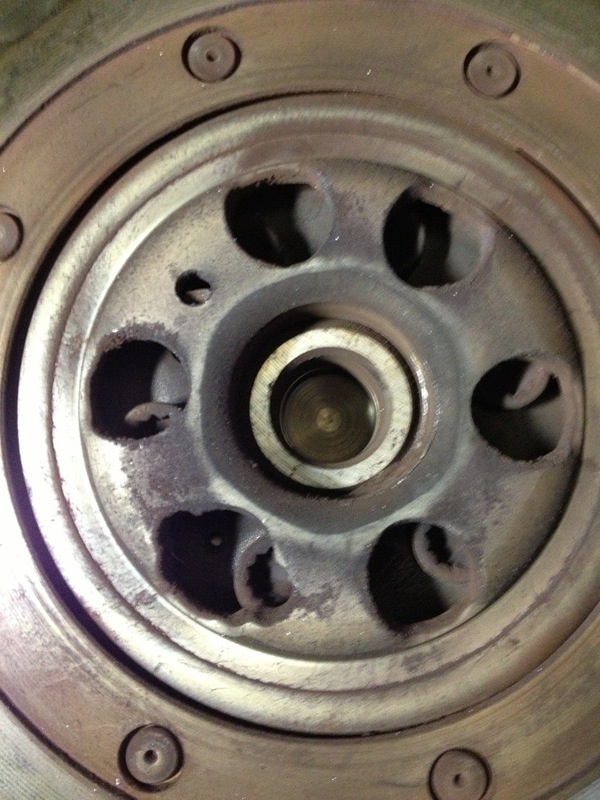 The bolts that are covered hold the flywheel to the crankshaft. So do the holes normally just line up with the bolt for access? So something broke and part of the flywheel turns separate from the rest? Yeah it looks as if the 2 sections of the dual mass have started to seperate and shift. VW has some signifigant issues. The valve body will almost always have to be changed. There are no short cuts when it comes to the vw transmission. Great blog and to read more you can go to our site.